Plants release a billion metric tons of isoprene and other organic gases every year. 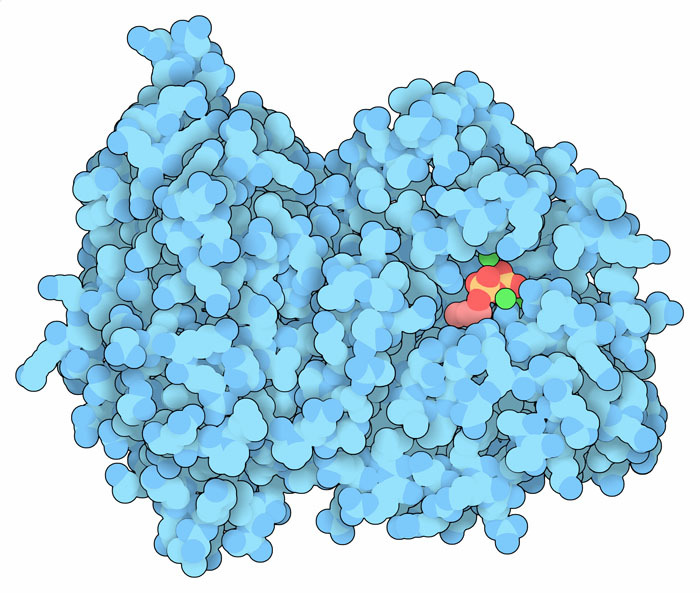 Isoprene synthase. An analog of DMAPP is shown in pink and magnesium ions are shown in green. You might be surprised to hear that plants emit a billion metric tons of organic gases into the atmosphere every year. About half of this is isoprene, a volatile organic compound produced by tall trees such as oak, aspen, poplar, and eucalyptus, found in forests around the globe. The amount of isoprene emitted by plants is so significant that it filters sunlight, forming the beautiful blue haze that intrigued Leonardo da Vinci and is seen today in scenic locations such as the Blue Ridge Mountains of the United States and the Blue Mountains of Australia. In plants, the enzyme isoprene synthase (shown here from PDB entry 3n0g) makes isoprene. Isoprene synthase breaks down dimethylallyl diphosphate (DMAPP), a building block used to construct many “isoprenoid” molecules such as fatty acids or steroid hormones. Isoprene synthase uses metal ions to remove the phosphates from DMAPP, thereby releasing isoprene. This isoprene plays important roles in the chemistry of our atmosphere. For instance, researchers have found that it reacts with hydroxyl radicals and nitrogen oxides in the air, ultimately increasing ozone concentrations. Our understanding of isoprene synthase is also allowing researchers to engineer new forms of the enzyme, to make isoprene for industrial production of synthetic polymers and rubber. Leaves exposed to sunlight experience rapid changes in their surface temperature, so isoprene is thought to protect leaves from reactive molecules formed by heat. Several lines of evidence support this beneficial function: synthesis of isoprene synthase in plants is linked to the seasons and leaves at the top of trees produce more isoprene since they are exposed to more sunlight. Although at lower levels, plants also emit isoprene in the absence of light, so isoprene is also thought to act as a defense mechanism to fight herbivores or reduce stress caused by drought. Isopentenyl diphosphate:dimethylallyl diphophosphate isomerases. A manganese ion is shown in green in the type 1 enzyme, and FAD is shown in pink in the type 2 enzyme. The isoprene precursor DMAPP and the similar molecule isopentenyl diphosphate (IPP) are used to build many important molecules in all kinds of living things, ranging from steroid hormones to electron carriers such as ubiquinone. Depending on which of these two molecules is needed, DMAPP and IPP are interconverted by isomerase enzymes. Two forms of these enzymes are found in nature: type 1 isomerases use a metal ion to catalyze the interconversion (PDB entry 1i9a) and type 2 enzymes use a nucleotide cofactor to do the same thing (PDB entry 1p0n). A large collection of enzymes uses DMAPP and IPP to build different isoprenoid molecules. Many of these enzymes, including isoprene synthase, share a common protein fold, termed the “terpenoid synthase fold.” Four examples are shown here. Isoprene synthase breaks off the phosphate and releases isoprene. Farnesyl diphosphate synthase (PDB entry 1fps) connects three of the isoprene units together to create a longer chain. Bornyl diphosphate synthase (PDB entry 1n20) forms rings out of these types of longer chains. Taxadiene synthase (PDB entry 3p5p) fashions a more complicated structure out of isoprene units for use in building taxol. To explore these structures in more detail, click on the image for an interactive JSmol. Isoprenoid molecules have a distinctive shape, with a zigzag string of carbon atoms and little one-carbon branches along the chain. For representative examples, take a look at the page for farnesyl diphosphate or search for molecules like chlorophyll, retinol or beta-carotene with the Chemical Component Search to explore the chemical structures of these molecules. These enzymes often use magnesium enzymes in the active site—based on the structures, can you discover what are these ions doing? F. Loreto & S. Fineschi (2015) Reconciling functions and evolution of isoprene emission in higher plants. New Phytologist 206, 578-582. H. Fuchs, A. Hofzumahaus, F. Rohrer, B. Bohn, T. Brauers, H. P. Dorn, R. Haseler, F. Holland, M. Kaminski, X. Li, K. Lu, S. Nehr, R. Tillmann, R. Wegener & A. Wahner (2013) Experimental evidence for efficient hydroxyl radical regeneration in isoprene oxidation. Nature Geoscience 6, 1023-1026. A. B. Guenther, X. Jiang, C. L. Heald, T. Sakulyanontvittaya, T. Duhl, L. K. Emmons & X. Wang (2012) The model of emissions of gases and aerosols from nature version 2.1 (MEGAN2.1): an extended and updated framework for modeling biogenic emissions. Geoscientific Model Development 5, 1471-1492. 3p5p: M. Koksal, Y. Jin, R. M. Coates, R. Croteau & D. W. Christianson (2011) Taxadiene synthase structure and evolution of modular architecture in terpene biosynthesis. Nature 469, 116-120. T. D. Sharkey, A. E. Wiberley & A. R. Donohue (2008) Isoprene emission from plants: why and how. Annals of Botany 101, 5-18. 1p0n: S. Steinbacher, J. Kaiser, S. Gerhardt, W. Eisenreich, R. Huber, A. Bacher & F. Rohdich (2003) Crystal structure of the type II isopentenyl diphosphate:dimethylallyl diphosphate isomerase from Bacillus subtilis. Journal of Molecular Biology 329, 973-982. 1n20: D. A. Whittington, M. L. Wise, M. Urbansky, R. M. Coates, R. B. Croteau & D. W. Christianson (2002) Bornyl diphosphate synthase: structure and strategy for carbocation manipulation by a terpenoid cyclase. Proceedings of the National Academy of Science USA 99, 15375-15380. 1i9a: J. B. Bonanno, C. Edo, N. Eswar, U. Pieper, M. J. Romanowski, V. Ilyin, S. E. Gerchman, H. Kycia, F. W. Studier, A. Sali & S. K. Burley (2001) Structure genomics of enzymes involved in sterol/isoprenoid biosynthesis. Proceedings of the National Academy of Science USA 98, 12896-12901. 1fps: L. C. Tarshis, M. Yan, C. D. Poulter & J. C. Sacchettini (1994) Crystal structure of recombinant farnesyl diphosphate synthase at 2.6-A resolution. Biochemistry 33, 10871-10877. F. W. Went (1960) Blue Hazes in the atmosphere. Nature 187, 641-643.